Please note this is NOT my picture. This is from the Knitty website. My Sheldon looks very similar, but not quite this good (I'm sure the pattern designer had time to perfect her Sheldon whereas I did it just for the first time and it turned out not too differently). The pattern can be found here. I have so many other projects to complete. A friend of mine is pregnant with their third(!) child, another boy (their first was a girl, then a boy, and now another boy on the way). That means a green Baby IQ afghan, and another toy. 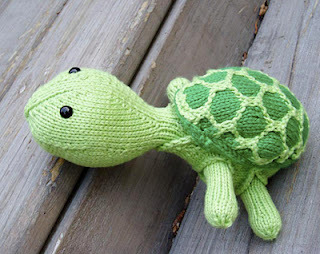 I might do a Sheldon for him, or another toy that I have a pattern for. I love the free toy patterns. If you know of any others, please let me know. I have a couple of crochet toy patterns, and some knitted ones as well. A friend bought me a book of knitted toys a few years ago, and I have to sheepishly (no pun intended) admit that I've only knitted one toy out of it. That might soon change. Christmas is coming, and we really don't have much money. There's a credit card (not much, but enough to eat away at any extra we might have), mortgage, food, gas, electricity, and other monthly bills to pay. Christmas is just around the corner and will be here before you know it.